The Nokia Lumia series with its Windows OS from Microsoft has been a great advantage for both fading market of Nokia and Microsoft Operating System the Windows Mobile OS 8. There have been many errors which are being faced by users of windows phones which we are going to help you solve and get rid of these errors. One such error which many have faced is the Error Code 80048823 during Updating or while downloading Apps. This error can be seen when you are either trying to update already Installed apps or when you are trying to Download and Install new Apps to your windows device. After Restarting your device try once again to Update the App or Install the app which should solve the problem. 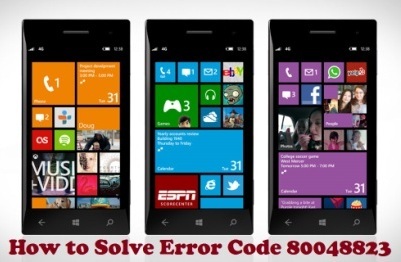 In case you get the Error Code 80048823 once again try the next trick which might be the solution. Changing the Keyboard language has sometimes helped solve this problem and updating the app or installing the app can mostly solve the problem. If the Error is still coming then please follow the step below which will surely solve the problem. You might get “Your password is out of date”, all you have to do here is Renter the Password you have been using. Now you should go and start the Updates or Installation of the Apps which were causing the error which will be installed easily without any problem. i had to restore my phone to factory settings and that worked at the end. it might be the last option if everything else fails. wat if ? if v forgot d password of our microsoft account??? Thanks – solution one above worked for me! Thank you very much – 3 worked for me. Which App installation is causing this error? which phone model are you using and what is your OS version ? Hi.I have this Huawei4Afrika windows phone with windows 8os.i can’t download any apps even after a hard reset error 0x80048264.please. Someone help.